One Wednesday in late April, Kristin Beller, a kindergarten teacher and president of the Wake County branch of the North Carolina teachers’ union, called her school’s central office to check on the number of personal days teachers had requested that week. It was three hundred, a normal amount. When she called back on Monday, there were eight hundred requests. The next day there were 1,200, at which point she was told the office was no longer allowed to speak with her. Three weeks later, on May 16, the first day of the legislative session, around thirty thousand teachers were marching on Raleigh, each having requested a personal day to attend the protest. The annual “advocacy day” held by the North Carolina Association of Educators (NCAE) typically draws about four hundred people. This year, so many teachers requested the day off that superintendents in forty-two of 115 districts from counties across the state were forced to close schools. With school out for summer, it might seem like the teacher strike wave has petered out. But what happened in North Carolina jumpstarted a process that lasted far beyond the one-day walkout. From the outside, it looked like the latest spontaneous domino in the wave of teacher strikes this spring. But it was actually the result of years of grassroots organizing, leadership development, and patient base-building. And while the national movement provided significant inspiration to North Carolina teachers, the grievances were intensely local. Nearly a decade of teachers’ indignation and frustration had finally found its expression. In North Carolina public school history books, George W. Bush is still president. Since the Republican takeover of the General Assembly in 2010, textbook funding has been cut from $73 million to $4 million, according to Beller. The corporate tax rate was reduced to the lowest in the country. North Carolina is a right-to-work state, has the country’s second-lowest union density (behind South Carolina) and enjoys no collective bargaining rights for public employees. Local organizers had no template for a mass strike, but the wave of teacher actions across the country gave them some pointers. After seeing Mingo County teachers in West Virginia begin their mass movement with a one-day strike, teachers realized that some group would need to go out first in order to generate momentum. The Durham local was the most organized, but how could they take the next step? They learned from the Oklahoma strike that superintendents would be forced to close schools if enough teachers requested a day off. It was only later that they remembered that this strategy had actually been tested locally in 2017, when so many school employees took personal days to attend the Day Without Women protest that the Chapel Hill-Carrboro City superintendent was forced to close schools. Yet, as influential as the national zeitgeist was, the real story in North Carolina begins years earlier, when organizers took cues from another moment of teacher militancy—the Chicago teachers’ strike. For one week in September 2012, 25,000 members of the Chicago Teachers Union struck at nearly six hundred schools. They eventually returned to classrooms having won demands to gain more curricular control over their own classrooms and a double-digit salary increase. But the internal reorganization of the union, from a top-down bureaucracy to a member-led social movement, was the most significant outcome. Both efforts were led by leaders who emerged from the Caucus of Rank and File Educators (CORE), an opposition movement inside the union. Inspired by meetings with CORE leaders in the wake of their strike, a small group of North Carolina educators decided that a social justice orientation, where the union is focused on connecting issues inside and outside the workplace, offered the best hope for meeting their local challenges. They formed Organize 2020, an internal caucus that set 2020 as the date by which they planned to have a fighting union. Initially, they did not see the official union as an avenue for progressive change. The NCAE was known for bringing members to the statehouse once a year, and not much else. The caucus formed to push an organizing agenda within the schools, and broaden the scope of the union’s role in workers’ lives. In 2013, the Moral Monday protests began bringing tens of thousands of citizens to the statehouse in Raleigh each week to participate in civil disobedience actions. The premise of Moral Mondays was to unite a spectrum of political viewpoints under a universalist agenda for healthcare, education, voting rights, and reproductive freedom. The movement won broad participation among local activist groups, but the NCAE was notably absent. Local teachers began independently canvassing at the events, however, and built a list of hundreds of rank and file educators. A core of that group contributed to strengthening Organize 2020 and were largely responsible for the success of May 16th. But in a right-to-work state, where workers can simply leave the union if they feel frustrated by leadership, the survival of such a caucus requires careful building of a solid base of support for its program. Today, a quiet tension exists between NCAE leadership and Organize 2020, who appear to be slowly building a militant movement in the shell of a bureaucracy. Many of its most active leaders, who are varying shades of socialist, won elected positions as officeholders of the biggest NCAE locals. This helps define the caucus as having an explicitly transformative political vision, not merely one that seeks to elect Democrats. Even if, in November, they plan to do just that. In many ways, the horizon of the NCAE is similar to the short-term goals of Organize 2020. The NCAE has long placed emphasis on routine lobbying. But on May 16, Organize 2020 forced representatives to leave the statehouse, whose physical structures seems designed to keep the public away, and meet their constituents on the long lawn outside the building, smack in the middle of the protest. Marchers were organized into county-by-county clusters, and asked their representatives to publicly sign a commitment to assist public schools in ways that benefited students, teachers, and parents. Wade ignored her. It was moments like this that allowed the union to flip the narrative usually put on teachers. It wasn’t the teachers who walked out on students, but rather politicians who have systematically underserved their own constituents. The experiences of North Carolina teachers highlight a longstanding tension for the Left. Do movements for electoral reform necessarily divert attention from the more important work of building strong grassroots organizations? Organizers believe the upcoming elections provide the best framework for the kinds of campaigning that will develop rank and file leadership and move its program. No one I interviewed for this article had faith in Democratic politicians to solve their problems. But all identified unseating the Republican supermajority as a necessary but insufficient condition for rebuilding some semblance of the public good. And that doesn’t mean just education. Extensive gerrymandering to dilute the black vote proved decisive for Republican Governor Pat McCrory’s win in 2013. This June, the legislature passed a measure permitting four majority white towns to create their own charter schools, a decision teachers say is part of a larger push to return to Jim Crow-era segregation. “We are fighting a new Confederacy,” says Anca Stefan, a teacher from Durham. Currently, all 170 seats of the state’s General Assembly are being contested. 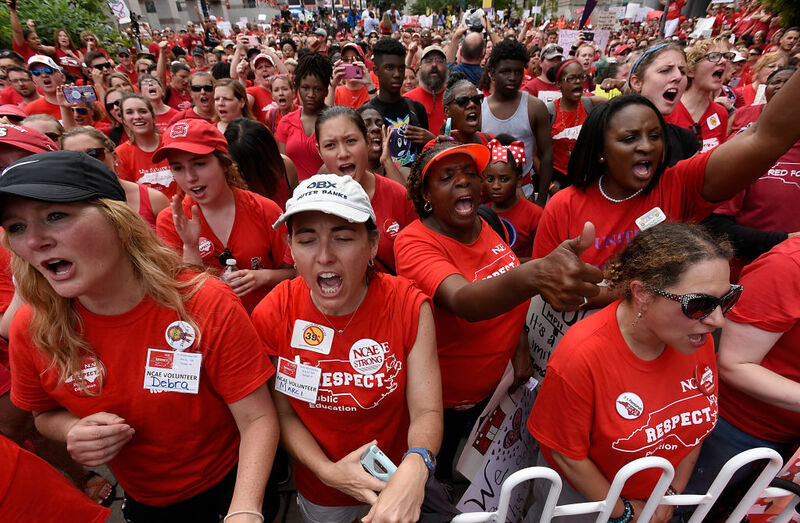 The November elections, and the small battles along the way, provide the context for, as Beller puts it, “practicing organizing.” Bryan Proffitt, an Organize 2020 leader and president of the Durham NCAE chapter that sparked the movement, concurs. “We are in constant campaign mode.” Such is union activity in a state that provides so few official channels for making gains. “The goods” are a handful of concrete demands that will strengthen public education. Teachers want increased per-pupil funding, higher pay for those with advanced degrees, smaller class sizes, to lift the cap on corporate taxation, and to place a cap on charters. But for those in Organize 2020 “the goods” are also new conditions under which to organize. There’s a growing consensus that the law barring collective bargaining needs to be challenged in the streets. If the caucus is going to prove its value in the long run, it will have to fight these kinds of transformative political struggles that separate the new spirit of unionism from the old. Since May 16, union membership has grown, and local school districts have been activated by the national #Red4Ed movement. The May rally, which had already been on the NCAE’s calendar, existed within the modus operandi of the union by massively amplifying its typical lobby day. But the future of the teachers’ movement lies with Organize 2020’s new radical orientation. Even so, large-scale change is unlikely to be confined to the work of caucuses or the union officialdom. Building a strong and diverse public-sector labor movement will require the kinds of deep organizing that is sometimes incubated in places that do not have strong labor rights.